Shuttle program managers today approved a plan to strip away fire bricks from damaged sections of the "flame trench" at launch pad 39A, to erect a steel grid over the exposed concrete back wall and to spray on a thick coating of heat-resistant Fondu Fyre to protect the structure from super-hot shuttle booster exhaust. The work, expected to cost less than $2.7 million, should be complete before the shuttle Atlantis is hauled to the pad at the end of August for blastoff Oct. 8 on a high-profile mission to service the Hubble Space Telescope. "We really like the plan ... and we approved it," said shuttle Program Manager John Shannon. "We expect to start moving out on it right away." During the shuttle Discovery's May 31 launch on a space station assembly mission, more than 3,500 fire bricks lining the northeast wall of the booster side of the flame trench at pad 39A were blasted away. Radar tracking showed some of the bricks shot out of the trench at some 1,000 feet per second, or about 680 mph. A detailed inspection found that many of the anchor plates used to secure the interlocking fire bricks to the 3-foot-thick concrete back wall were heavily eroded due to decades of exposure to severe pressures and acidic rocket exhaust. In addition, epoxy used to help secure the bricks to the wall was degraded or not consistently applied when the pad was built in the mid 1960s. As a result, the outer brick wall was not tightly locked to the underlying concrete wall it was designed to protect. "We did find evidence of a fracture joint along a construction joint between the first and second panels of the east wall," said Perry Becker, chief of NASA's structural systems branch at the Kennedy Space Center. "We believe that fracture was brought on by a number of different components. We have found erosion of some anchor plates that were used to secure the brick to the back wall. We've found degradation of the epoxy that was used to adhere the brick to the back wall. We have found evidence of acid deposition in that area. We've found evidence of carbonation in the area, which leeches the calcium out of the concrete, which reduces the strength of the mortar-to-concrete joints." Becker said the damage that occurred during Discovery's May 31 liftoff apparently happened when a Fondu Fyre patch over an area of earlier erosion ripped away seconds after booster ignition. "We believe, based on pre- and post-launch pictures, that we liberated a Fondu Fyre patch that was put over an area of fairly significant erosion," he said. "We think the lack of adhesion on that wall resulted in some bowing off the back wall and resulted in the liberation of that patch. Once that patch was liberated at launch, we believe that created the intrusion point that got the hot gas behind the wall." Once booster exhaust gases got behind the brick layer, "we had impingement on the back wall and with no real adhesive strength left in that local area, we started a localized failure," Becker said. "Due to the interlocking nature of the brick, we believe that led to a cascading failure on down the wall." To fix the trench, a 25-by-100-foot section of the east wall of the trench will be stripped of bricks, as will a 25-by-80-foot section of the west wall. A steel mesh-like structure will be erected over the exposed backwall and then covered in sprayed-on Fondu Fyre, a material already used to protect the massive flame deflector directly under the shuttle's boosters and main engines. Working two 10-hour shifts per day, the repair team expects to have the brick removed by July 19. After that, the mesh will be erected and the Fondue Fyre applied. 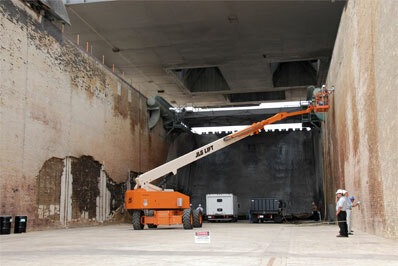 Space shuttle processing manager Rita Willcoxon said the repair should be complete by the third week in August. The shuttle Atlantis is scheduled to be hauled to the pad Aug. 29. Becker said the repaired flame trench will be closely inspected after every launch, but he expects it to hold up through the end of shuttle operations in 2010. Nearby pad 39B is believed to have similar weaknesses in its flame trench. But no major repairs are envisioned in the near term. All 10 remaining shuttle flights are scheduled to use pad 39A and while NASA could use pad 39B for a rescue mission should Atlantis suffer major damage during the Hubble flight, a detailed analysis shows no debris from either pad's flame trench could reach a shuttle or cause any damage. "We also discussed in a lot of detail the transport analysis to see if there was any risk to the space shuttle vehicle from anything liberated from the trench," Shannon said. "We got good results that said that would not be any kind of a risk to the vehicle." Pad 39B currently is being modified for use by the new Ares 1 rockets that will carry the Orion crew capsules intended to replace the shuttle. A longer-term fix for the flame trench may be required down the road, but no final decisions have been made.